We finally had the pleasure of coordinating a wedding ceremony at UGA's Catholic Center one early afternoon this summer. Kaitlin + Jeff had all of their closest friends and family in attendance to celebrate their union and bear witness to their love for one another. Having such an early ceremony, their guests were able to enjoy a long cocktail hour with passed hors d'oeuvres and signature cocktails. 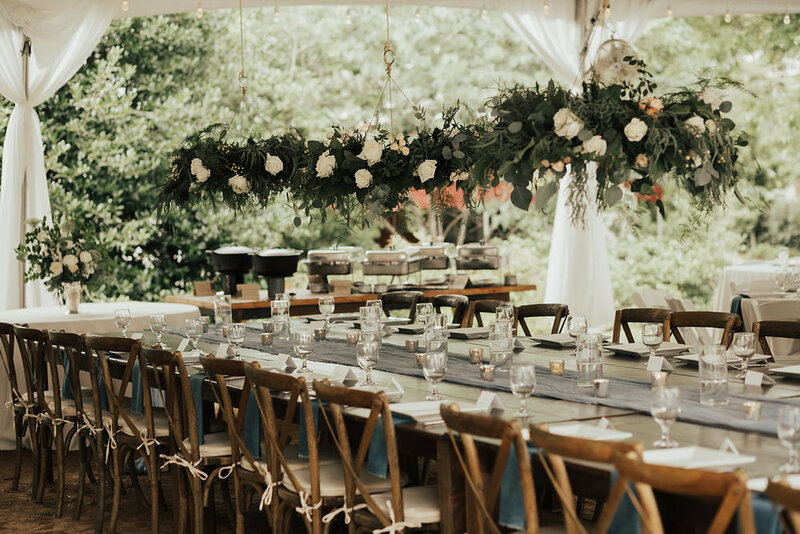 Once invited into the welcoming back patio of The Taylor Grady House, where Kaitlin dreamt of having hanging centerpieces, and Brett with European Floral followed through with in eager excitement, dancing, dinner, and merriment ensued. It was truly a joy to have helped them through the planning and design process, and none were as thankful as both she and Jeff. After all, hugs and words of gratitude, and seeing their sheer bliss having experienced the day of their dreams, that's what it's all about y'all. Today we are sharing an old Southern tradition with our own moody-chic twist on it... One of our fave photographers, Noi Tran, worked with us on this fun inspirational shoot. The story goes that if you bury a bottle of bourbon in your ceremony site exactly a month before your wedding date, you will have perfect weather for the day of. Even though it was a little gloomy the day we shot this, we're still swooning over these pictures (but hey, it didn't rain)! And... We're super pumped that our friend's over at Burnett's Boards recently shared this shoot!